The Mediterranean Island of Malta will be represented by Christabelle Borg at the Eurovision Song Contest held in May in Lisbon, Portugal. With the song “Taboo”, she just won the big advertising show they call their national selection. 129 songs were submitted to the Maltese national final Malta Eurovision Song Contest (MESC). They were first cut down to 30, and then again to the 16 acts competing tonight – and let’s make it clear right from the beginning that Malta clearly wins the first prize for most adverts in a show. With adverts every 10 minutes, and even on screen during the performances, no one can take that award away from them – but of course, that’s nothing new, as followers of their shows will know. The show did however find space for Malta’s 2017 Junior Eurovision Song Contest participant Gianluca Cilia to entertain with a few songs, one of them being his entry Dawra Tond. We also saw, last year’s Eurovision participant Claudia Faniello as interval act. 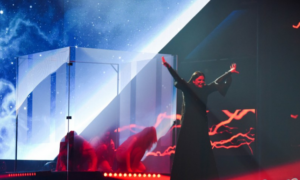 In a combination of 50% jury, and 50% televoting, Malta found its winner, who will go on to fly the Maltese flag as their 31st Eurovision participant. To the Maltese viewers, and also the international finals, the national final was a good mix of well known names who has taken part several times before, and even a former Eurovision participant in terms of Richard who was part of the band Firelight in 2014 (This time he performed with his father), plus some new comers hoping to win on their first attempt. Since its debut at the contest in 1971, Malta has participated 30 times prior to 2018. It’s participation was irregular in the beginning, and it wasn’t until 1991 the country became the committed member we know today. The Mediterranean Island is yet to win the contest, but they have been close. In 2002, Ira Losco came second with the song 7th Wonder, and just three years later, Chiara and her Angel repeated that. In recent years, the country has had problems reaching the final of the Eurovision Song Contest. Since the 2007 contest, they failed six times. Last year, Malta was represented by Claudia Faniello and the song Breathlessly, which also didn’t advance from semi-final to final. This year, the country will compete in the second semi-final, which on paper looks to be a bit stronger than the first one, however Malta will perform in the second half. Listen to the song Taboo in the video below.